On this episode of Live Fix Radio, we explore the live music laboratory of Chicago-based experimental rock band The Earth Program as they give us an exclusive tour of their Spook House practice studio. 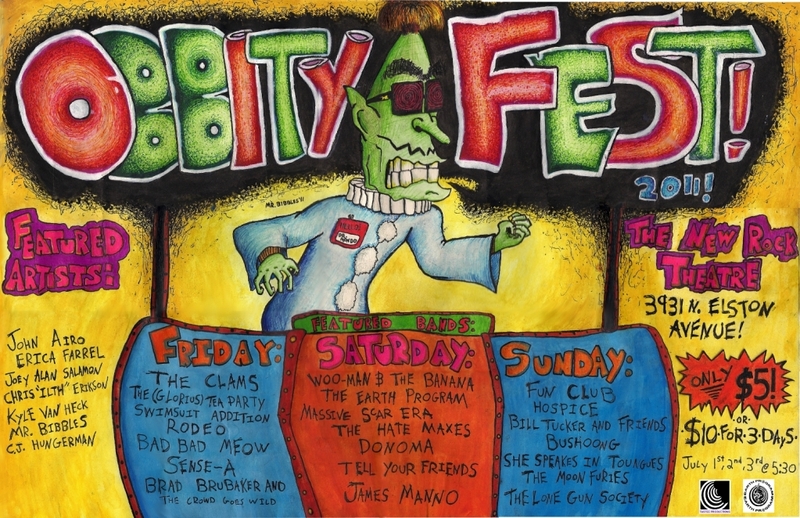 The ambitious quartet also shares the inside scoop on ObbityFest 2011, a 21-band music and art festival going on in Chicago this weekend. As we told you in our initial Obbityfest preview we have a lot in common with the festival’s experimental side. And musically it features DIY, punk / rock / psychedelic music and art from as far away as Egypt. And during this special bonus podcast interview, all four members of the band take us on a wild ride through the curiously awesome world of Obbityville, a parallel universe of artistic inspiration, musical community and creative resistance. Fun! Check out the Obbityfest 2011 free mixtape sampler download. Lots of fun was had at Obbityfest! Here’s a video and Colleen’s Flicker set of photos capturing our favorite moments seeing The Earth Program and “a music fan’s best friend” rock the stage at the New Rock Theater. Tickets can be purchased at door day of event. Will The U2 360 Tour Claw Live On As A Permanent Venue?